The Shooting Bandit helps put your arm in the correct position every time you shoot. By giving your arm the right amount of volume of motion, this Shooting Bandit Aid can be used on either arm to develop the right shot. 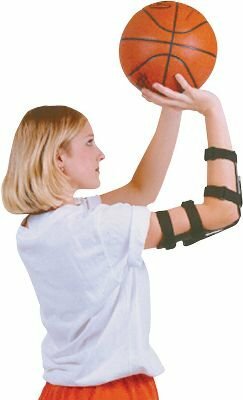 This one size fits all arm brace can improve your shot in as little as two weeks. Purchase The Shooting Bandit Aid today and get the perfect shot you've always wanted! Missing far too many shots? Outlaw is the foolproof approach to enhance your three-point array and foul shots. The Outlaw Basketball Shooting Support places your arm in the correct position to take your shot every single time offering your arm merely the proper volume of motion. It can be utilised on either arm to create and develop proper right-handed or left-handed basketball shots.